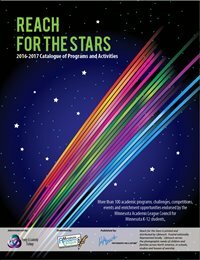 Schools across the St. Croix Valley are receiving over 1,000 free copies of the 2016-2017 Minnesota Reach for the Stars Guide thanks to St. Croix Valley Gifted and the Synergy & Leadership Exchange. “It makes good sense to ensure the St. Croix Valley can tap into the vast Minnesota K-12 learning and enrichment resources Reach for the Stars gathers in one place,” says incoming chapter president Margaret Thomas. St. Croix Valley Gifted has made the guide’s print edition available in past years at their chapter meetings, but discovered in July that no existing direct efforts placed these guides into the hands of local students and teachers. What’s in the Reach for the Stars Guide? Reach for the Stars puts over 100 academic programs, challenges, competitions, events and enrichment opportunities for K-12 students at your fingertips. Each listing has received the Minnesota Academic League Council‘s endorsement. Who should pick up a copy? Teachers, student counselors, instructional coaches, parents and students all will find something useful in Reach for the Stars. Download our letter to students and educators with more details. You can also pick up a free copy at any upcoming St. Croix Valley Gifted chapter meeting.